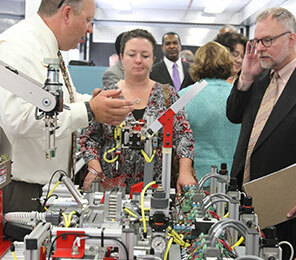 Across New Jersey, Advanced Manufacturing employers face the challenge of finding qualified candidates with the necessary skills required for employment in this industry. In addition, they also have needs to enhance the skills of their current workforce. 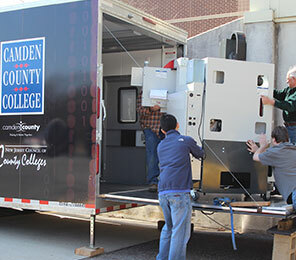 To address this workforce development initiative, Camden County College, along with the other New Jersey community colleges and the New Jersey Community College Consortium for Workforce and Economic Development determined that they could assist employers by making mobile learning labs available to deliver training programs throughout the state. 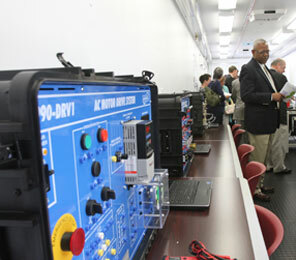 Each 48 foot by 8-foot trailer comes with mobile generators and is equipped with a 384-square-foot classroom, including computers, flat screen TV’s, Wi-Fi and current industry training equipment to provide hands-on training for up to 10 students. Funding for this initiative was provided by the USDOL Trade Adjustment Assistance Community College and Career Training (TAACCCT) Grant. 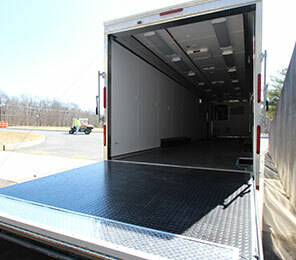 Both training labs are available for use at private employer locations to train current employees and at community colleges to train dislocated workers.